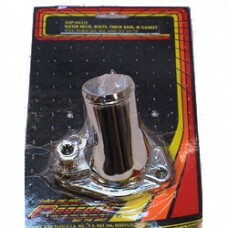 Proform chrome thermostat housing. Outlet directs centrally front to rear on the engine and is angled up at approximately 45 degrees. Supplied with gasket and mounting bolts. Fits Small Block Ford 289, 302 & 351W, was originally used on 1965 to 1975 engines.